So finally all of the stars, and the Sun, Moon, and Jupiter, aligned and I had the time and enough equipment to do some observing in my own back yard. My 24" is inside the dome on the left, and a C-14 is in the rolling roof building. The dome on the right is empty. Also, just the stuff in front is mine. 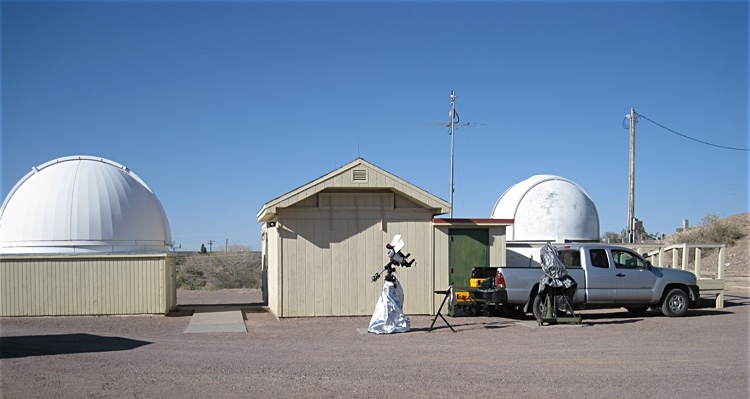 Everything else belongs to the Etscorn Observatory at New Mexico Tech. They have a couple of cement pads in the courtyard for setting up temporary rigs. I had the place all to myself Saturday and Sunday. Nice. I got to the observatory about 1PM on Saturday and got the usual suspects mounted up and rigged for some solar observing. 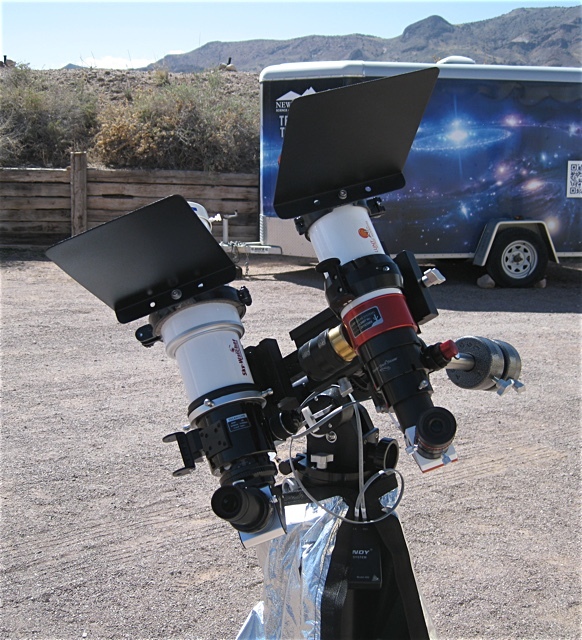 The one with the red section is the Lunt Solar Systems 60mm Hydrogen-alpha scope, and the white one is a Sky-Watcher Esprit 80ED APO. 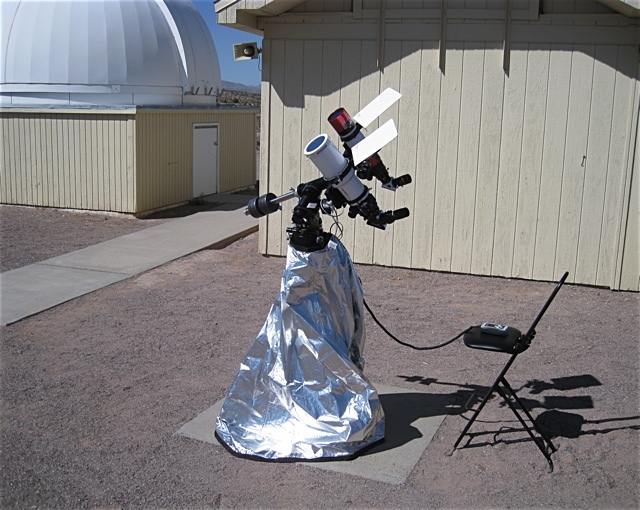 I wrapped the tripod in a TeleGizmo blanket to keep it out of the hot sun, but the air was so cool that none of the metal really warmed up. That was good. I didn't do any imaging of the Sun, but it was going pretty crazy on Saturday. There were prominences all over the place. You should have seen it. I spent part of the afternoon working on getting the two telescopes to point at the same spot when mounted on the dual saddle side-by-side bar. I failed. Part of the problem was I couldn't loosen the bolts holding the Sky-Watcher's saddle, move the scope a little and retighten. I had to take the scope off in order to loosen the bolts. They make $550 saddles that make it possible to adjust one of a pair of scopes on-the-fly, but I don't think I'll be spending that much. I'll probably just spend thousands of dollars and learn how to do machining stuff myself. Someday. 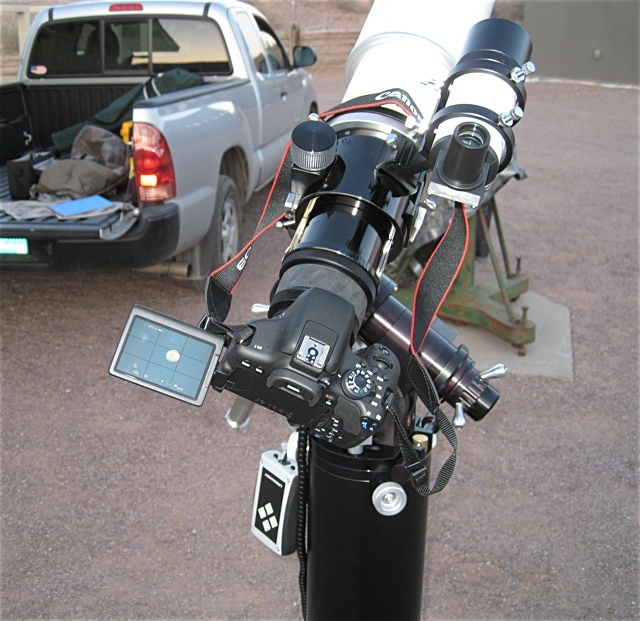 Learning a bit from the trip to Arizona last month I tried swapping the telescopes on the side-by-side. The chunk of brass that is the pressure tuning cylinder on the Lunt scope sticking out when the Lunt was mounted on the left made balancing a bit impossible. Moving the scope to the right side helped a lot. When it is mounted by itself, well, there's not much you can do, but in that case it's not very far from the center of the mount, so it isn't so bad. 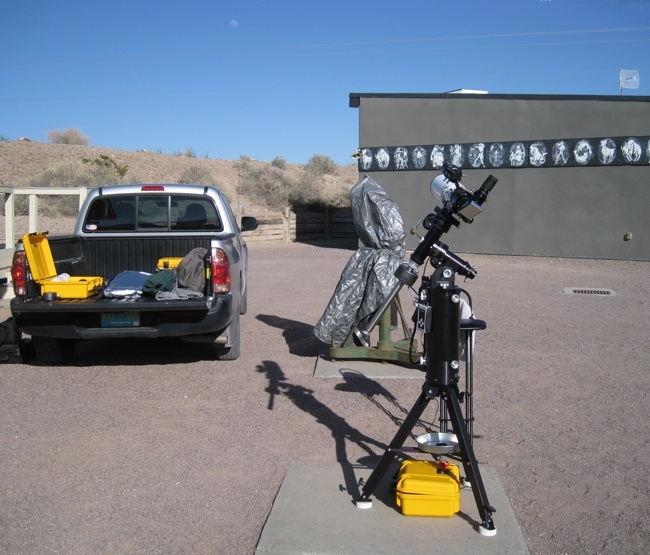 That's the New Mexico Tech portable astronomical unit in the background. They load up a few telescopes in there and haul them around the area for outreach events. One of the Dobsonians they have is even signed by John Dobson! The haze started to get the best of the solar observing late in the afternoon, so it was time to reconfigure the setup for nighttime operation. All that means is that I took the Lunt telescope off, took the solar filter off the front of the Sky-Watcher, and re-balanced. Real complicated. Part of the reason for this weekend's activities was to test out the Canon T6i that I had gotten during the week. The goals were to see if the camera worked, and to see if I could make the camera work. Things went well. I only pulled out a few hairs to get the camera configured to a non-picnic/vacation mode of operation. You basically just turn off all of the automatic stuff. Why can't they just make a DSLR like that? Oh wait...they used to. The Sky-Watcher is made for this kind of thing. It comes with all of the reducers, flatteners, and camera adapters to attach a Canon DSLR. Despite it getting a little breezy and cool, and me not wanting to stay out too late the camera did a pretty good job. Our little moon. 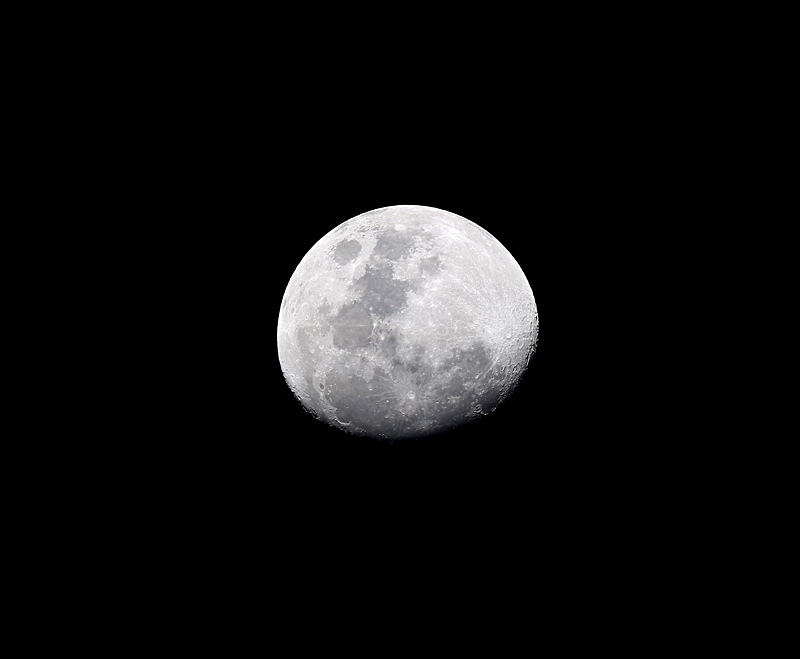 1/160s 400mm f/5. I think I just messed with the contrast a little bit in Pixelmator. 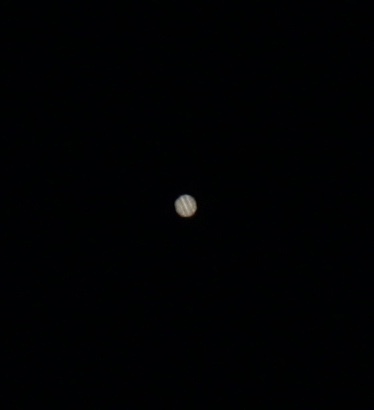 While I was waiting for it to get a little darker I just took this one shot of Jupiter. It was still way down low. At the prime focus of this telescope it's just a dot on the picture. This is a ~400x400 pixel crop from the 24 megapixel whole. It came out surprisingly good. That telescope is not really made for planetary work. 1/125s 400mm f/5. 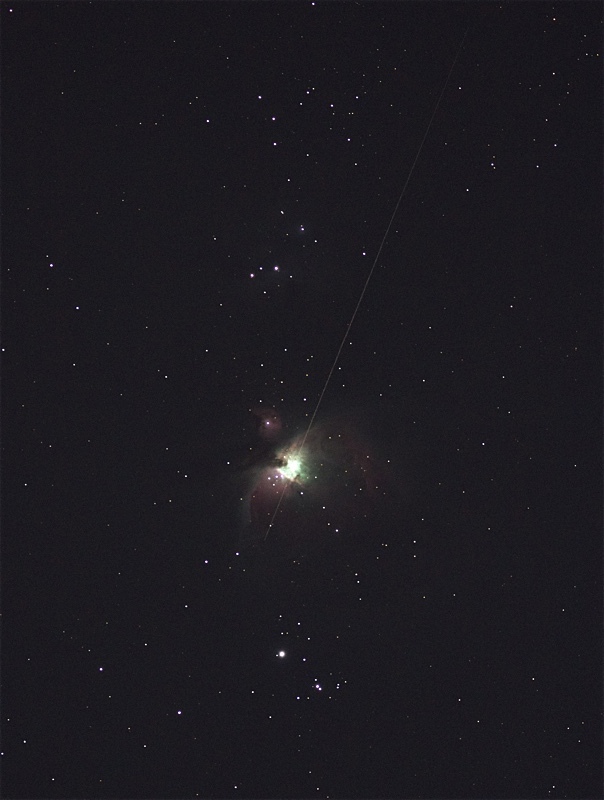 So the ultimate goal of the evening was to redeem myself from the image of M42 taken in Arizona. This is much better, but still not very good. It was not much past sunset, the Moon was out in almost full force, and I could see the camera glowing red from the high ISO setting. This was an 8 second exposure at ISO1600. Not sure if that's a satellite or a meteor trespassing there. Now that I have a clue what to do I'll be able to do a better job next time. This is way different than the ol' film days. OK, technically it's the same, but it smells way different. Sunday was just some additional fiddling and looking at the pretty clouds blocking my view for a few hours in the afternoon. It was fun anyway.